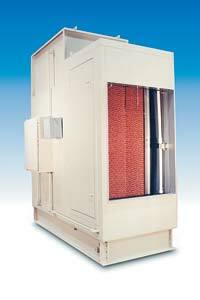 Model EPX indirect evaporative coolers are designed for conditioning outdoor air in dry climates. New, patented process for manufacturing the polymer heat exchangers results in assembly in a fraction of the time formerly required. The polymer tube indirect evaporative coolers achieve a nominal 75 percent wet bulb depression effectiveness. Power required as low as 0.1 kw/ton.